This Belgian-inspired IPA is a blend of Old World traditions. Brewed like a Belgian Ale but hopped like an IPA. Pine and citrus notes blend with flavors of apple and pear. I’m not sure what to expect mainly because I can’t remember how long I have had this beer. I know it was given to me by my friend Gene it could have been a year or more ago. We’ll just have to see if this in another interesting aging experiment or a lesson in what not to do with a gift from a friend. The beer pours a clear deep golden straw with copper hues and a bright white head. The nose is very inviting with those classic Belgian yeasty aromas with notes of citrus. Not a bad first sip but I can’t help feeling that I’m missing something. The taste starts out with a very light malt sweetness up front followed by effervescence as the ale washes over the tongue in the middle of the sip. The back end is very easy drinking with effortless swallow. There is also another release of carbonation on the swallow that masks any flavors. The finish is pretty none eventful, this is where I expected some hop flavors but received no more bite than a simple pale ale. This was not a bad taste or flavor just lacking such. There is a bit of citrus and maybe grapefruit on the finish but these flavors are much diminished. Or at least I suspect that they are diminished from what they were when this bottle was fresh. Also missing from the taste of this beer are those classic Belgian yeasty notes on the finish. Maybe I should re-group and tell you want I am tasting instead of what I’m not. The beer is clean and refreshing with nice light malt flavors and a touch of citrus and grapefruit notes on the finish. All and all this is a very good pale ale. It however is not a very good Belgian IPA. It could be that it’s age caused it to lose its identity. Or perhaps this is another clear case that the “Overall” rating of the beer is drastically different than the “In Style/Class” rating. In this case the overall would be a B+ to and A- but more like a C in class. I’m not going to grade this review. I will wait until I find another one of these in season and give it another review. 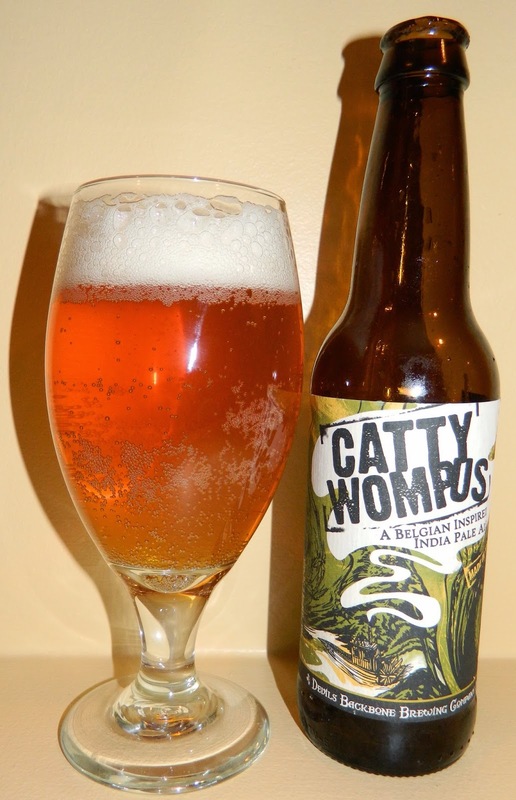 Catty Wompus is a very interesting Pale Ale. The Belgian IPA characteristics may have been aged out of this particular one but all and all it was a very good experience. I will have to review again when in season.